There’s a lot to consider when planning a community event and the list of “To Dos” can be quite overwhelming. From the venue, to the time of day, how much food to order or what kind of music to play in the background – it takes a little bit of know-how and a lot of preparation and organization to host a successful event. As we gear up to celebrate National Healthcare Decisions Day with a weeklong dinner party and collaboration with Death Over Dinner* we bring you two guest speakers on this month’s community call (March 17th 3 p.m. EST) who could teach a Master Class on the ins and outs of pulling together a large community event or a small intimate gathering in your home. Brian Carpenter, a professor of psychology and the leader behind “Death Comes to Dinner” and Nathan Kottcamp, founder and chair of National Healthcare Decisions Day will share examples of how to promote and encourage participants to take part in an event where the taboo topic of end-of-life care is the central theme. They’ll offer suggested resources to guide the conversation and share anecdotes on how they managed to get tough crowds to open up. Carpenter and Kottcamp will also talk about the benefits of inviting media to your events to broaden the reach of your work and help destigmatize dining and discussing death. Kottcamp will also talk about the creation of National Healthcare Decisions Day and his decision to set the date April 16th -the day after Tax Day – because as the saying goes, “nothing is certain in life but death and taxes.” As cheeky as that may be, it is a great reminder that there are many “red letter” calendar days that can be used to promote the conversation and host similar style events. Whether it’s resolving to talk about end-of-life care wishes in the New Year giving mom and dad the gift of peace of mind this Mother’s Day and Father’s Day, or honoring loved one’s lost on Memorial and Veteran’s Day, join us for a roundtable discussion on creative ways to execute events that will help you introduce this important conversation to your neighbors and loved ones. *National Healthcare Decisions Day takes place on April 16. DeathOver Dinner is a nonprofit organization that encourages interactive dinners to discuss end-of-life care topics. The Conversation Project is celebrating National Healthcare Decisions Day by teaming up with Death Over Dinner the week of April 16-22 and challenging Americans to commit to hosting a dinner and fill their table with comfort food, family and friends and talking about how they want to spend their final days. Although, at almost 90, I have instigated The Conversation with my two daughters as well as holding discussions with a small church group, I am very interested in learning more. Unfortunately am working at that hour but am very interested, will there be other opportunities to be included? 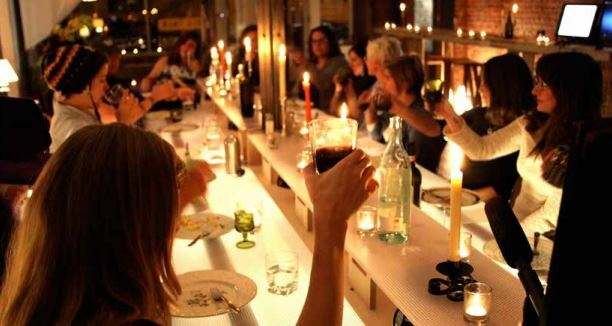 Tracy – You must contact Death Dinner Party, they are in Sydney & Melbourne!